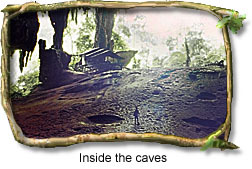 The Niah National Park, Sarawak is the site of the Niah Caves, one of the largest limestone caves in the world. The Park covers 3,102 hectares (7,756 acres) of forest and limestone. The peak of Gunung Subis, which is 394 meters high (1,294 ft), dominates the landscape. One may explore the vastness of the Great Cave, where archaeologists have discovered evidence of man's existence in Borneo dating as far back as 40,000 years ago. On display are the skull of a young Homo Sapien, some tools made out of stone, bone and iron, and cave drawings. Anthropologists established that the Niahian lived in the Caves from 40000 BC right up to 1400 AD. As more than half the park is covered with limestone, limestone vegetation is the most common variety of plant life. The families of Balsaminaceae and Begoniaceae are commonly seen at the entrance of the Traders' and West Mouth Caves. Peat swamp and mixed dipterocarp can also be found in the Niah. Animals are not easy to spot, but if you are lucky you may catch a glimpse of the park's inhabitants: long-tailed macaques, bulbuls, trogons, squirrels, flying lizards, Rajah Brooke butterflies, hornills, mouse-deer, and water monitors. Flora Fauna: More than hal the park is covered in limestone resulting in limestone vegetation predominating the common herbs. Animals are not easy to spot buy you may catch sight of the long-tailed macaques, bulbuls, trogons, squirrels, flying lizards, Rajah Brooke butterflies, hornbills, mouse-deer and water monitors. Between the months of August and December, and from January to March, visitors can also observe the harvest of swiftlet nests in the Great Cave. The nests are the primary ingredient of bird's nest soup. Niah National Park is accessible by road via Miri or Bintulu, 2 hours from Miri and 3 hours from Bintulu, to the Park Head quarters. If you travel by bus, you will have to take a boat along the Niah river from Batu Niah town to the Park Ranger's office.